I've Been Sick, But I'm Carrying On! January has been a disaster. I've been sick since day one, and I just can't seem to shake it. Headcold that morphed into the stomach bug, and now I'm running a fever. February can't get here soon enough! 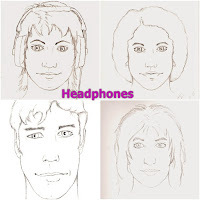 I finished the Headphones: In From the Cold rewrite Tuesday, so I was only a couple of days past my goal. It clocked in a little over 70K, making it 10K longer than my minimum goal, so I'm really happy about that. And it's also probably why I went past my goal date. The plan now is to finish the edits on Embers and Flame, write the query and synopsis, submit it around, and then return to Headphones. There are two more books to write, after all! And, in the meantime, I'm working on outlining Jeb (from Blind Ante) and Ian's story. “That’s the idea. I want everyone to know you’re mine.” But he stopped and let me put an inch of distance between us. “You can have your pick. Any of the women in there. They fawn all over you. So, why me? What do I have to offer?” Okay, I’d never realized that liquor made my inner monologue less inner, and instead, more nakedly on display. But I couldn’t stop myself. All my doubts, all my fears, rushed out; a wave of insecurity that I didn’t even realize I’d been hoarding. “I’m nothing special. Hair that won’t lay down, freckles everywhere, colorless eyes. No special talents. I’m not interesting. I’m a codfish.” Ben was speechless as I spewed it all out. “Hell, one woman in there told me I must give really good head. As if that’s the only reason you’d be with me. Is that it, do I give good head?” I paused to draw a breath, but Ben stopped me with another kiss. I had hoped to have Headphones: In From The Cold done by yesterday, and I'm close, maybe only a chapter and a half. And I might have made it, but something family related came up that cut into my hours on Friday and Saturday. And I had a bout of the stomach bug going around that kept me in bed most of yesterday. Even so, I got in 7810 words, taking the novel to 66691. So I passed my 60K goal easily enough. Fingers crossed, I should be done in a day or two. And then I'm finishing my edit of Embers And Flame so I can query it. Then back to Headphones. Going to run a quick edit on this one, and hopefully find a beta reader or two before I start on the next book in the trilogy. Hopefully, the next two will go quicker! Scoey did his best to concentrate on his customers, but his efforts were marginal at best. Over the course of the next two hours, his attention continued to wander back to the couple in the corner. He analyzed every movement; the way Jay brushed his hair behind his ear or looked up through his eyelashes. He bristled when the man laid his hand on Jay’s arm, a touch that lasted two seconds too long. The twinkle of the mop-head’s laughter was clear, even over the jukebox and raucous clamor of fifty voices. Somehow, without realizing it, Scoey found the bottom of the bottle of whiskey. As Scoey announced last call, the two stood and leaned together, whispering into each other’s ear before sharing a full-bodied clenching hug. With stomach reeling and head swimming, Scoey threw the washcloth back into the sink and crashed through the swinging doors into the storeroom. He braced both hands on the wall while his body heaved with his shaky breaths. When a shadow solidified behind him, he turned to find Jay contemplatively watching him. “What do you want?” he barked. “Need my jacket. I left it here.” Jay was puzzled by Scoey’s harsh tone. “Are you leaving with him?” Scoey asked, emphasizing the “him”. Happy New Year! May 2018 Be Our Year! Gulp, I haven't updated in almost a month! But to be honest, it was December, so I was busy with work, cookies, and events every weekend. 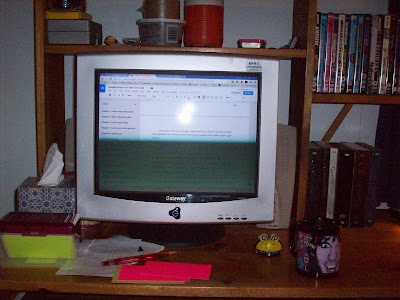 And then my daughter came home for two weeks, so I had to move all of my stuff out of the spare bedroom and move it into our bedroom, which wasn't the most conductive to writing, because my husband was in and out. Having said that, I did get 23K words written, putting Headphones over 53K at this point. My goal for the novel is 60K+, so I'm easily tracking. Unless things go sideways in the next couple of weeks, I should finish "Out of the Cold", the first volumn of the Headphones trilogy, by mid-month. Then the challenge will be finding a few beta readers to give me some feedback, because I'm really up in the air on this one. But I'm not giving up! Jay chased Headphones around the backyard, and her squeal turned into a hysterical laugh as he wrestled her to the ground to retrieve the hat that she’d yanked off his head. It was too bad [Mick] knew what he thought he knew about Jay and Scoey--even if they didn’t know it, yet, and he wasn’t sure that even made sense, but there it was-- because his young guitarist and his androgynous keyboard player were clearly fond of each other and he thought they would make a good couple. Damn Jay’s pesky attraction for Scoey. The fact that the tall bartender was standing next to him and was watching the two with the same intensity as his own only confirmed his suspicions. “Do you think they…?” Scoey started to say, but didn’t finish the thought as he watched the two.